Eye bolt suitable for a wide range of uses, such as horticulture, displays, general home DIY and commercial applications. Trade Packs - Bulk quantity packs offering you incredible value for money. 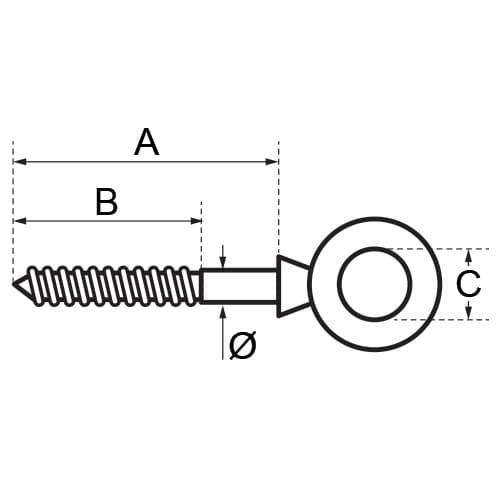 Wood screw thread eye bolts (also referred to as vine eyes, screw eye bolts, eye screws, or turned/bent eye lags) have a wood or lag screw thread for use in wood, masonry or lag anchors. Eye bolts are commonly used to attach cables to objects. Suitable for direct wood mount, simply combine with a plastic wall plug for masonry mounting. Often used as a plant training aid (vine eye, screw eye), or to lay wire trellis. S3i supplied this product to the family featured in the BBC One series 'DIY SOS: The Big Build' and was used as part of a life changing transformation to the home of a family in Rednal, Birmingham. Good quality product. Used to fix carabina clip to dog lead at front door. Excellent service , with prompt delivery, Thank you. As described and first rate. Great quality really well made and quick delivery. Will be buying more. does what it says on the tin. Not something to get wildly excited about, but very well made and just what I needed. High quality and looks great in the oak beams sure it will last forever. Used these to make a wire trellis for Wisteria to grow along. They were easy to use and are working well. Having purchased the same product previously from S3i, I was disappointed in the reduction of quality, and weight. You have clearly 'value engineered' your offering. As described. Good value. Excellent service. Ace, and great value for bespoke wire fencing system. 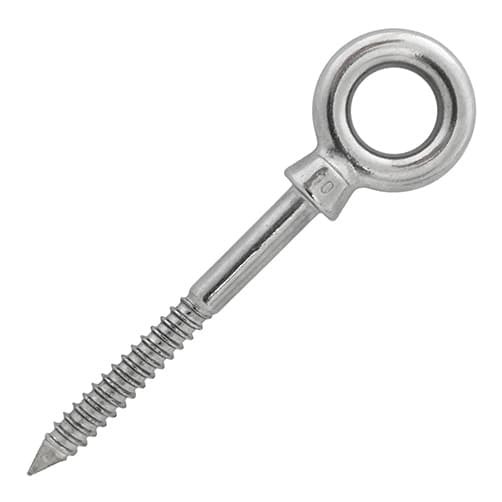 With Open Body Turnbuckle Hook - Eye, Wood Screw Thread Eye Bolt - Vine Eye, Gripple Standard Hanger - Loop End and gripple. All the products we bought were great quality, looks great and we will definitely purchase from S3i again, delivery was really fast and all full order was complete, Very Happy Customer. Excellent product, good value for money. Excellent service and great product. Brought various sizes for a project, excellent quality and exactly what I wanted. Good and chunky. It all looks good. Sturdy, stainless steel marine grade product. Quality cast Stainless eye screws used on oak pergola for plant wires. The quality of the product is very good and the delivery speed excellent. I recommend it to everyone. Great fixing for the project we have. Very well made and exactly what I wanted. Nice quality and does the job. Really great product. Very high quality and great price! Highly recommended. Used for garden trellis wire supports. Easy to fit. Good quality product and good looking too. Very easy to put together a great looking system of wires for our plants. Fantastic product, perfect for our sun sail. Pre-portioned flexible chemical Anchor Resin Foil Capsules for a quick and easy fixing with no waste. Injection Resin for anchor points in brick, concrete and stone, simply apply with a chemical anchor gun. Recommended for removing debris and dust from drill holes, a Cleaning Brush provids a clean surface for anchor resin to be applied. Ideal for removing the smallest of dust particles from drill holes an Air Pump ensures a clean fixing surface.